This guest post by Windy Arey-Kent of NC Aquarium at Pine Knoll Shores is the second in a 3-part series on NC Aquariums' Innovative Solutions Grants+ project, aimed at testing different approaches to engaging guests for conservation action at aquariums. This blog post is a mid-way update on the program. The North Carolina Aquariums, with support from The Ocean Project's Innovative Solutions Grants + Program, are engaging in an experimental program this summer to encourage our visitors to help the ocean and its animals, as well as themselves, by purchasing Renewable Energy Certificates (REC) for their homes. 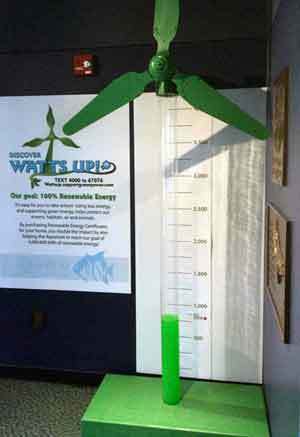 This also is helping our aquariums reach our own clean energy goals thanks to the watt-for-watt match provided by our partner, Greenlight Energy. By using the same "ask," – purchasing a REC - but different approaches at each of our four facilities, we are able to contrast and compare effective strategies across our sites. We aimed to measure success not only in the number of RECs purchased, but in visitor and staff experience with visitor exit surveys and staff interviews.. We've learned a lot so far, and will be making some adjustments so as to have the most successful outcome possible. Here's a quick update! 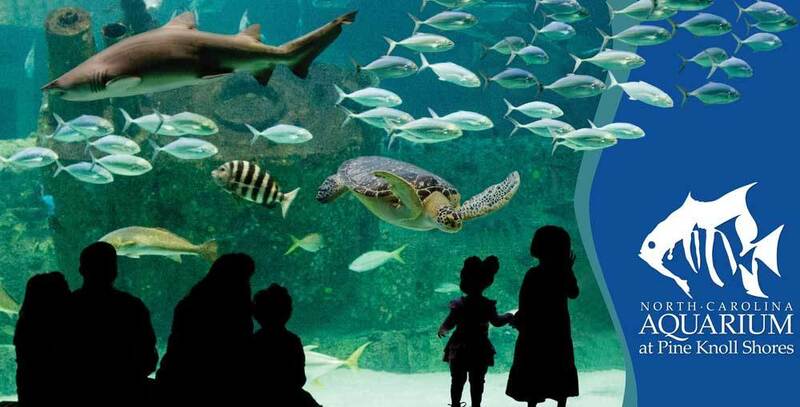 At my own site, the North Carolina Aquarium at Pine Knoll Shores, we developed a "social marketing campaign" to engage visitors in the REC program. We have a ‘windmill’ display in the Aquarium lobby introducing the REC program, signage throughout the facility, and have had some social media and email correspondence with members. While visitor response to the issue and our ideas has been positive, this primarily passive approach has not been very effective in generating purchases. We did have 259 ‘hits’ to our sign-up website and 43 ‘text to’ hits, but no signups for the RECs. In July, we had significantly more, with 754 ‘hits’ to the website. But at the end of July, we had sold only 903 kWh. At Fort Fisher, we are applying a more active engagement approach with a set of interpreter-led programs. These include auditorium programs, where an interpreter interacts with up to 125 visitors; dive shows, where an educator is talking to a diver in the tank; and a feeding at the biggest tank, where an educator narrates while an aquarist interacts with animals. In keeping with the interpretive model developed by the National Network for Ocean and Climate Change Interpretation (NNOCCI), the interpreters explain RECs and the watt-for-watt match, while putting it all into context for their audience. 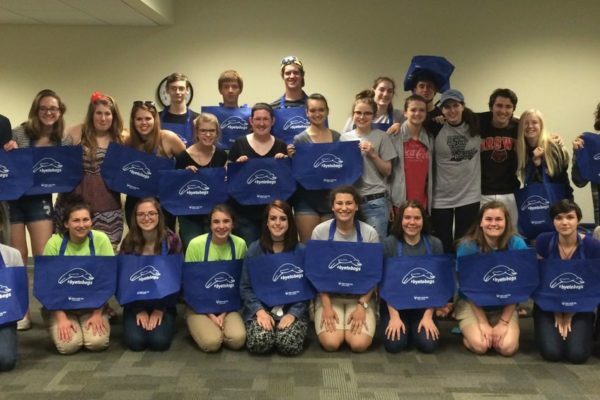 There is a focus on shared values as an inspiration to take action: the current generation’s responsibility to protect the environment for future generations; the interconnectedness of life on earth, especially how humans are impacted by how we treat the environment; and the innovation and ingenuity of America – basically, we have the power to solve this problem! Also, we take care to position this “ask” as fitting the size of the problem, encouraging visitors to join with their community to support a clean energy future. This has been the more effective approach of all four sites! Since Memorial Day weekend we have done 254 formal programs that have included asking visitors to consider the purchase of RECs. With the one-for-one match from Greenlight Energy we have sold over 31,572 kWh in June and July. And, importantly, the program has been really well received by our educators, staff and the public. On Roanoke Island, our approach has been to promote REC’s on site with a touch screen kiosk and pull up banner to draw the visitor's attention, combined with a trained interpreter available to engage the visitor and answer questions each weekday from 10:00 a.m. – 3:00 p.m. -- this approach was promising in theory, but has proven to be challenging in practice. The educator was trained on-site by the Education team and participated in online trainings hosted by Greenlight. He has tried many different methods of approaching visitors – anyone interacting with the kiosk, stopping in front of the banner, or pausing near the display is approached in a cheerful, upbeat passionate way about supporting wind power. He distributes small green cards with a ‘text to’ option for more information about signing up for RECs, and most folks will slip that in their pocket. Visitors have welcomed the information, but very few have followed through. At Jennette’s Pier, there is no educator interacting with the public and explaining the REC program. Instead we have a touch screen exhibit with three short video clips explaining RECs, the watt-for-watt match, and the benefits of wind energy. This has been our biggest lesson learned, as from anecdotal observations, a typical visitor spends less than a minute in front of the touch screen and does not spend time going through the video clips, let alone signing up. After we had our initial sign-up data and first round of visitor surveys by the end of June, we concluded that at all sites visitors are interested in the issue of clean energy and welcoming of suggestions about how they can take action, but RECs are largely unknown, meaning that they have to be explained and put into context, while the action of acquiring a REC has to be simple, simple, simple. With regards to explaining the RECs, we've seen the power of a trained interpreter, especially when that interpreter is incorporating this ask into a program such as a dive show or feeding and can really connect the issue with the audience. As for the sign-ups, we were surprised that so many wanted to skip that step, preferring to donate money directly, trusting that the aquarium would use those funds towards the purchase of the RECs. Moving ahead, my own site, Pine Knoll Shores, is adding this ask into some small group interpretative programs, and all four of our sites are adding donation boxes, collecting money to purchase REC’s directly rather than requiring sign ups. And we will be continue to look at whether visitors are more motivated to donate when the ask is presented as part of an interpretive program, whether or not the presence of the donation boxes makes a difference, as well as what happens if a small incentive such as a window cling is offered. As the visitation cycle changes and crowds decrease, additional changes may be incorporated at individual sites to help us promote REC’s interpretively and programmatically, which could contribute to higher success. Stay tuned!